What Are The Benefits of Home Wind Turbines? 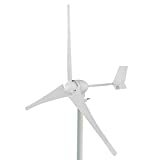 The benefits of a home wind turbine depend entirely on its wind speed and turbine efficiency. So the more energy a particular wind turbine produces, the better. 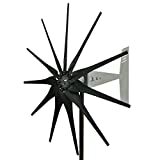 A standard home wind turbine can cost around $30,000, though more expensive variants can cost as much as $70,000 (plus installation costs and other miscellaneous expenses). If you’re short on cash, there are turbines that cost less than $10,000, but they don’t produce a lot of power. Related: Are wind turbines worth the investment? Before you install a set of wind turbines on your property, be sure to complete the following checklist first. – Find out what the local zoning laws have to say with regards to wind turbines. Some communities may not allow their installation, while others may offer certain incentives. – Find out how much energy your property consumes every month, and compare it with the projected amount of power your turbines can offer. If the turbines cannot offer enough energy then you may have to find a secondary source of power to supplement the turbines. – Determine the amount of wind that passes through your property. Make sure that it is sufficient to power your wind turbines all year round. 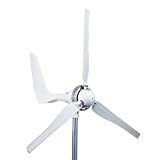 – When buying a home wind turbine, make sure that they are certified by the Small Wind Certification Council, which oversees the quality of all wind turbines currently available in the market. Once you have covered all these issues, you can purchase your wind turbines and install them on your property. Grid tie 3KW wind power system. 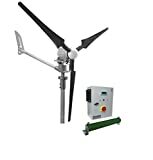 Including: 1pcs 3KW wind turbine; 1pcs 3KW grid tie controller; 1pcs 3KW grid tie inverter; After your order please tell us your voltage ,110V/220V ,50HZ/60HZ. FEATURES: Integrated automatic braking system to protect from sudden and high wind speed. Easy DIY installation methods with all materials provided. Can be used in conjunction with solar panels. MPPT Maximum power point tracking is included. Made with high quality Polypropylene and Glass Fiber material with a weather resistant seal. PROTECTION AGAINST: UV protection coating, Sudden voltage surge and wind gust, high wind speeds with integrated automatic braking system + manual braking switch and over charging of battery. 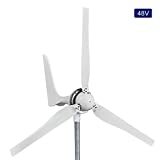 SPECIFICATION: Rated power: 1500W, Rated speed: 46 ft/s, Voltage system: 24V, Cut-in wind speed: 5.6mph, Suggested battery capacity: 200A or larger, Number of blades: 3, Rotor diameter: 5.6 ft and Weight: 33 lb. INCLUDES: 1 x Center piece (Generator), 1 x Tail Piece, 1 x MPPT Charge Controller, 3 x Blades, 1 x Nose cone, 1 x Manual brake switch, Amp meter display box, Hex Screws, Locking nuts, Spacers, Hex keys and 1 x Operational installation manual. WARRANTY: 1 Year manufactures warranty. 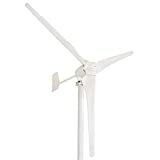 SPECIFICATION: Rated power: 1200W, Rated speed: 31 MPH, Voltage system: 48 Voltage, Cut-in wind speed: 4.5 MPH, Suggested battery capacity: 100A or larger, Number of blades: 3, Rotor diameter: 5.6 ft and Weight: 33 lbs. INCLUDES: 1 x Center piece (Generator), 1 x Tail Piece, 1 x MPPT Charge Controller, 3 x Blades, 1 x Nose cone, 1 x Manual brake switch, Hex Screws, Locking nuts, Spacers, Hex keys and 1 x Operational installation manual. One advantage of our wind turbine generator is that the turbine does not need to be pointed into the wind to be effective, which is an advantage on a site where the wind direction is highly variable. 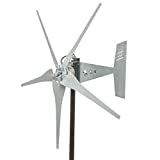 1000 Watts rated wind turbine generator kit. Requires low energy to start up and generates great energy. No noise. The product package includes generators, blades, controllers, screws , bolts and nose cone. Permanent magnetic triple phase AC generator. Easy installation and 1 year warranty on maintenance. Raptor carbon fiber blades withstand 125 mph - Guaranteed for a lifetime, not to break under normal use. The permanent magnet generator has a 28 rare earth magnet rotor inside and our skewed stator core for easy turning - up to 2000 watts max output! The Missouri Freedom II Wind Turbines have a cut-in wind speed of 6 MPH and NO COGGING! Each Freedom PMG rotor contains twice as much copper than any Delco style PMA - more copper means more power!